You can host multiple websites on your ASUSTOR NAS by setting up virtual hosts. However, before setting up virtual hosts you should obtain a unique hostname for your ASUSTOR NAS either by registering for your own domain or by subscribing for DDNS service. If you have a static IP address, then you most likely will want to register for your own domain name. The company you register with will be able to provide DNS service for your unique hostname. You only need to provide them with your IP address and they will help you to map your hostname to your IP address. If you have a dynamic IP address, then you may want to subscribe for free DDNS service in order to obtain a unique hostname for your ASUSTOR NAS. There are a number of companies offering free DDNS service. However, in our example we have decided to use no-ip.com. After registering with the company, you will be able to create a unique hostname and then have it mapped to your dynamic IP address. The company will periodically update your IP address in order to ensure that it is always mapped to your hostname. ASUSTOR NAS supports virtual hosting for hosting multiple domain names on the NAS. In the following example we will walk you through the process of hosting a website using the virtual host function. Select [Services] → [Web Server]. Select the [Enable Web server] checkbox found under the Web Server heading and then click [Apply]. In order to check that the setting has been successfully applied, enter the ASUSTOR NAS’s IP address into a Web browser and connect to it. You should be able to see the “Congratulations!” page as shown in the graphic below. This page is located in the ASUSTOR NAS’s “Web” shared folder. 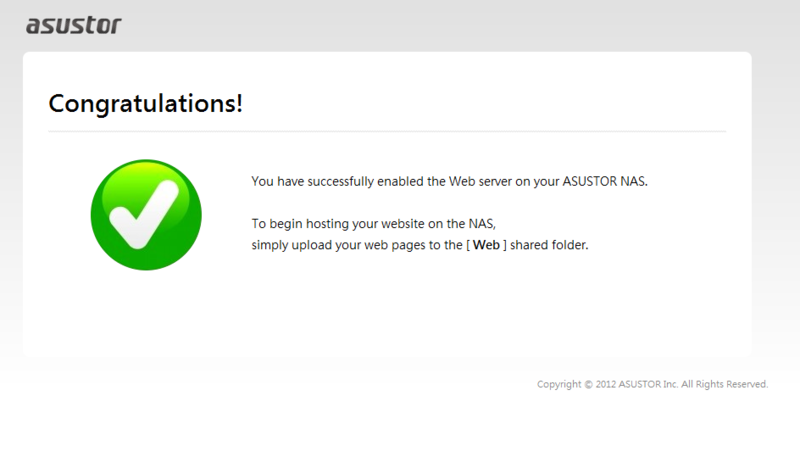 In order to host a website on the ASUSTOR NAS, you must upload it to the “Web” shared folder of the NAS. 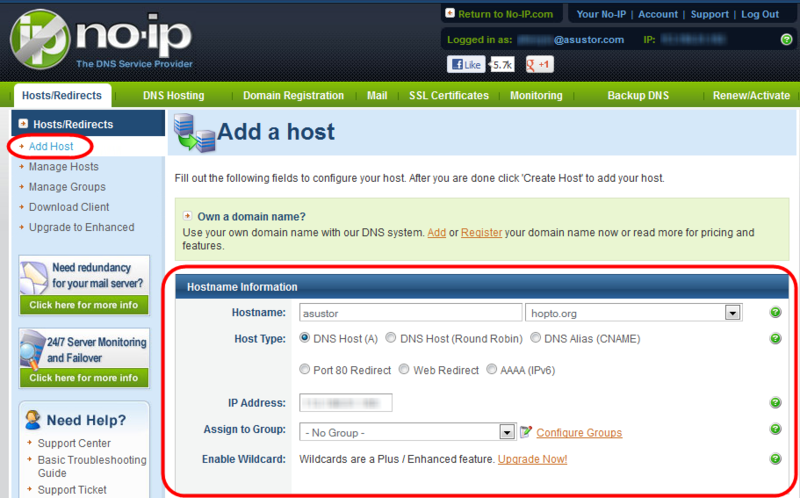 Now click on the Virtual Host tab and then click on the [Add] button. The Virtual Host window will now appear. Fill out the required fields and then click [OK] once you are done. Your website should now be successfully hosted on the NAS. If you have subscribed for DDNS service, you can also create a unique hostname to use with your NAS. In the following example we will walk you through the process of enabling DDNS service on the NAS. ü Select [Settings] > [Ease of Access] and then click on the [DDNS] tab. ü Select the [Enable DDNS service] checkbox. ü Select your DDNS provider from the drop-down list. If you haven’t signed up for DDNS service you can select a provider and then click on the Sign up now link to register. ü Fill out the rest of the required fields and then click on [Apply] once you are done. DDNS service should now be successfully enabled on the NAS.